The uncertainty and unpredictability of Hugh's condition is probably the hardest thing to cope with. I can never truly relax. And when I do, he likes to remind me just why I need to worry. He really keeps me on my toes. 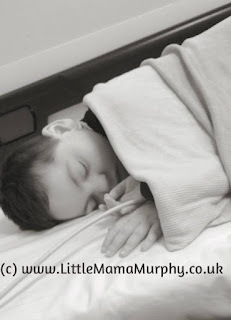 When his seizures were daily or weekly, I knew where I stood. There was always another one coming; we just didn't know if it would be hours or days away. We lived in a heightened state of awareness; always ready, always prepared. The hospital bag was always packed. We simply waited for the next seizure and responded when it happened. It was hard work, really hard work. But it was predictable. Now we go months between seizures, and I'm grateful for that, I really am. I'm grateful for all the 'normal' days we've had; the days we can go out as a family; the days where we've laughed and played and had fun. These were the things we missed when Hugh was really bad so I know how lucky we are to have them. But the thing is, I get used to it, I *feel* normal. I make plans. I take my eye off the ball. And then out of the blue, it starts again. Months of stability and he needs resuscitating twice in the night. It never gets easier. I never get used to it. It breaks my heart and terrifies me beyond belief. This time he was in acorns, our children's hospice. We'd taken his big brother Sean out for a meal as a treat. Just as we were going to bed they rang to say Hugh had stopped breathing. It's been three months since he last needed resuscitating. Three months where he's been stable. Three months where I start to hope that maybe, just maybe, it won't happen again. We've been encouraged to write an advanced care plan for Hugh. This, depressingly, is a plan which outlines what we'd like for his end-of-life care, what level of resuscitation he should have and what happens, when ... You know ... After. I've resisted. I don't want to think about it. But when he's well it feels a little safer to discuss it. After three months without needing resuscitation it feels like a hypothetical scenario. Last week I booked a meeting to discuss his advanced care plan. The meeting is tomorrow. Today it doesn't feel like such a hypothetical discussion. Today, again, it all feels terrifyingly relevant.